And among the beautiful paths and necessary methods of teaching is that the learner is not presented with a combination of two subject matters at the same time, for indeed it is unlikely that he will gain proficiency in one of them due to having to split his attention and being diverted from one of them in order to comprehend the other; so he finds both subject matters unclear and difficult, and thus fails to [accomplish] both. However, if the mind of the learner is unhampered whilst studying the subject matter and confined to it, then perhaps that will make it more suitable for him to accomplish it. And Allaah is the One Who guides to what is correct. 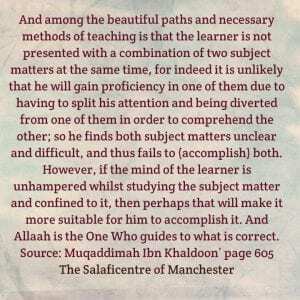 Indeed, we have seen that many teachers in this era of ours are ignorant of the effective methods of teaching, so they present to the learner – in the beginning of his studies – affairs of knowledge that will be an obstruction to [the learner’s understanding and motivation] and requires him to concentrate on untangling them. They [i.e. 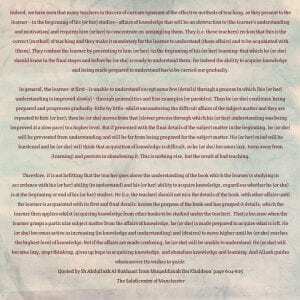 these teachers] reckon that this is the correct [method] of teaching and they make it mandatory for the learner to understand and to be acquainted with [those affairs]. They confuse the learner by presenting to him -in the beginning of his learning- that which he should know in the final stages and before he is ready to understand them; for indeed the ability to acquire knowledge and being made prepared to understand has to be carried our gradually. In general, the learner- at first – is unable to understand except some few [details] through a process in which understanding is improved slowly through generalities and fine examples [or parables]. Then he continues being prepared and progresses gradually -little by little- whilst encountering the difficult affairs of the subject matter and they are repeated to him; then he moves from that [slower process through which his understanding was being improved at a slow pace] to a higher level. But if presented with the final details of the subject matter in the beginning, he will be prevented from understanding and will be far from being prepared for the subject matter. His mind will be burdened and he will think that acquisition of knowledge is difficult, so he becomes lazy, turns away from [learning] and persists in abandoning it. This is nothing else, but the result of bad teaching. Therefore, it is not befitting that the teacher goes above the understanding of the book which the learner is studying in accordance with his ability [to understand] and acquire knowledge, regardless whether he is at the beginning or the end of his studies. 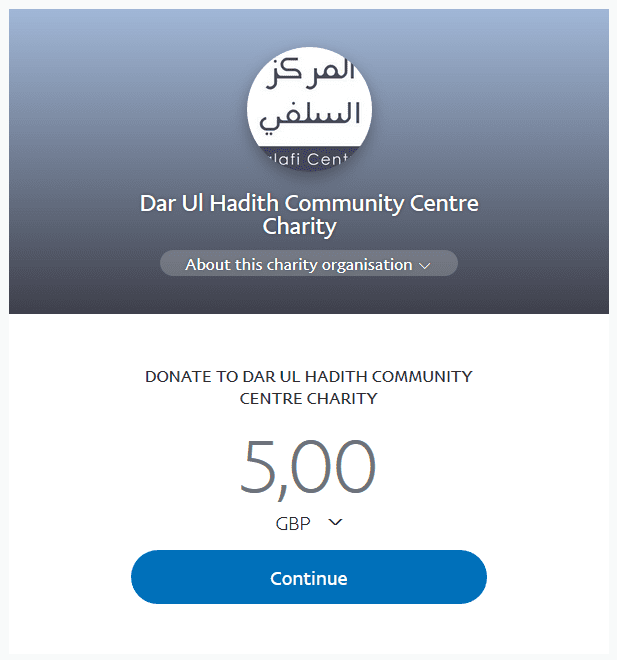 The teacher should not mix the details of the book with other affairs until the learner is acquainted with its first and final details; knows the purpose of the book and has grasped it details, which the learner then applies whilst [acquiring knowledge from other books to be studied under the teacher]. That is because when the learner grasps a particular subject matter, he is made prepared to acquire what is left. He becomes active in increasing [in knowledge and understanding] and [desires] to move higher until he reaches the highest level of knowledge. But if the affairs are made confusing, he will be unable to understand. He will become lazy, stops thinking, gives up hope in acquiring knowledge, and abandons knowledge and learning. And Allaah guides whomsoever He wishes to guide.